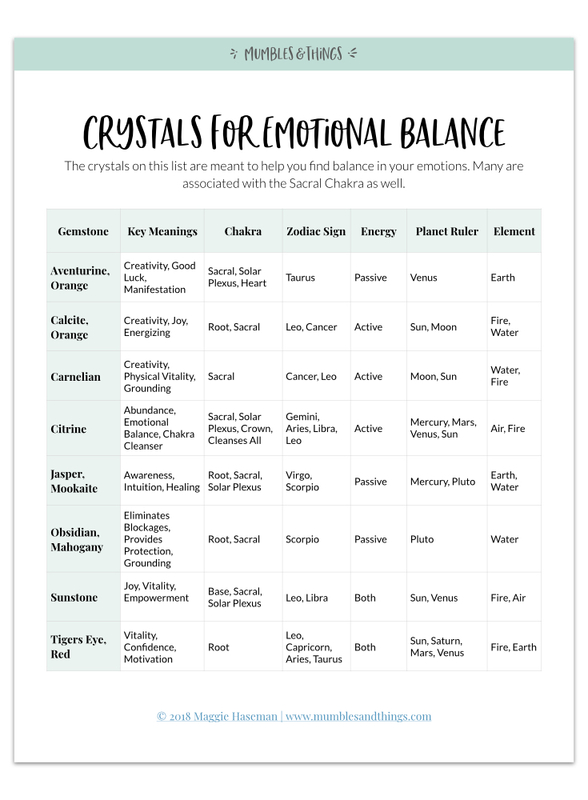 The crystals on this list are meant to help you find balance in your emotions. Many are associated with the Sacral Chakra as well. The second chakra, also known as the sacral chakra, is located at the pelvis and is usually pictured as being orange in color. This energy center is key for sexuality and hormonal balance, which affects the entire body. No matter what stage of life you are at, this chakra can be thrown off by trauma or illness. Some people ar uncomfortable with their own sexuality, and that can throw this chakra out of whack too. 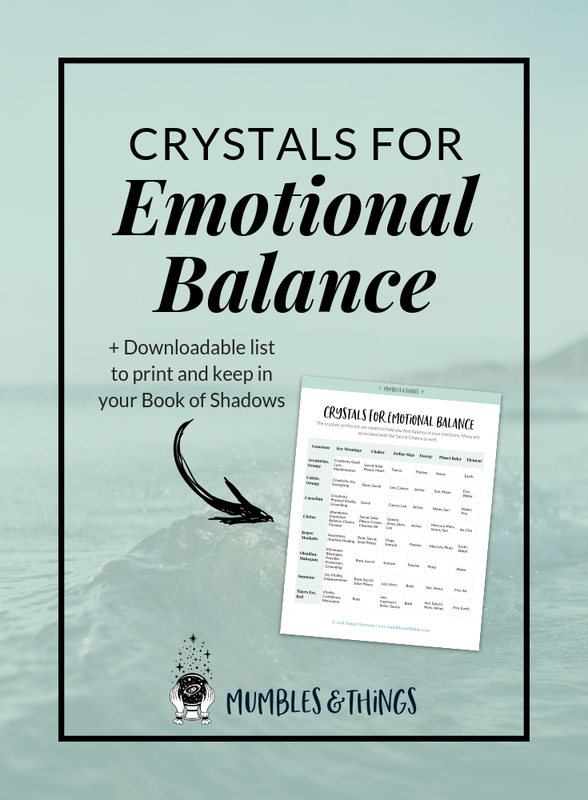 This is a list of crystals to use when balancing your emotions. A form of chalcedony, Carnelian is used for peace and harmony. It is excellent for restoring vitality and motivation, and for stimulating creativity. This stone helps you trust yourself and restores self-confidence. Carnelian protects against envy, rage, and resentment, calming anger and replacing it with a love of life. Some also consider it to be a boost to sexual energy, which makes sense if you look at all its other aspects. Citrine is a powerful cleanser and regenerator, useful for cleansing the chakras, particularly the sacral and solar plexus. Carrying the power of the sun, this is an exceedingly beneficial stone. It is warming, energizing and highly creative. This is one of the stones of abundance, teaching us how to manifest and attract wealth and prosperity, success and all good things. This stone promotes enjoyment of new experiences and encourages exploring new ideas. You might think that all stones are associated with the element of earth, but there is one that is also connected to fire, and that is obsidian. This stone is so shiny and cool looking because it comes from volcanoes as a naturally occurring glass that is formed when lava cools very fast. Mahogany Obsidian contains oxidized Hematite or Magnetite, coloring it brownish or reddish. With a gentler energy than Black Obsidian, Mahogany Obsidian gives strength in times of need, vitalizes purpose, eliminates energy blockages and stimulates growth on all levels. It is a stabilizing stone that restores the correct spin to the sacral and solar plexus chakras. A type of Jasper, Mookaite provides a useful balance between in and outer experiences. It imparts both a desire for new experiences and a deep calm with which to face them. A flexible stone, Mookaite encourages versatility. Mookaite is associated with gut feelings, instinct and intuition, pointing out all possibilities and assisting in making a choice. It aids the flow of energy and information throughout the body from body to mind and from mind to body. Aventurine is a very positive stone of prosperity and abundance. Thought to be a good luck stone, Aventurine can be useful when manifesting your intentions. Orange Aventurine vibes particularly well with the sacral chakra. This stone brings together the intellectual and emotional bodies, calming anger and irritation. It stabilizes your state of mind and enhances creativity. Orange Aventurine promotes empathy and encourages perseverance. It sees alternatives and possibilities, especially those presented by other people. Generally Calcite is a powerful amplifier and cleanser of energy. It removes stagnate energy from your environment and from your body. Orange Calcite in particular resonates with the lower chakras especially the sacral chakra. This is a highly energizing and cleansing stone. Orange Calcite balances the emotions and removes fear. It can be useful when resolving problems and maximizing your independent and interpersonal potential. Sunstone is a joyful, light-inspiring stone. It reestablishes a love for life when it seems to have lost its sweetness. Use Sunstone to nurture yourself to reveal your true self to shine through happily. Sunstone clears all the chakras, particularly the sacral chakra, and brings the light and energy of the sun into every moment. This stone can be particularly useful if you struggle with saying "No" and continually make sacrifices for other. It removes codependency and facilitates self-empowerment, independence and vitality. Combing the earth energy with the energies of the sun, Tigers Eye creates a high vibrational state that is nevertheless grounded, drawing the spiritual energies to the earth. Tigers Eye helps you recognize your needs and those of others as well. It is a protective stone that encourages integrity and restraint of power. It assists in accomplishing goals, recognizing inner resources and promoting clarity of intention. When use with the sacral chakra, Tigers Eye can refocus a spaced out person and give guidance to someone who lacks commitment. What stones do you use for emotional balance and working with the Sacral Chakra? Tell me about it in the comments below.